The oil palm produces two types of oils; crude palm oil (CPO) from the fibrous mesocarp and crude palm kernel oil (CPKO) from the kernels. Although both oils originate from the same fruit, palm oil is chemically and nutritionally different from palm kernel oil. It is one of the only two mesocarp oils available commercially, the other being olive oil. In conventional milling process, the FFB’s are steriliszed and the fruitlets stripped off. The loose fruitlets are then digested and pressed to extract the CPO. The kernels are separated from the fibrous mesocarp in the press cake and later cracked to obtained CPKO. Crude Palm Oil is the richest natural source of Tocotrienols. The Malaysian Palm Oil Board (MPOB) has developed a special patented technology for extraction. The latest technology to purify Tocotrienols from the fruits of oil palm (Elais guineensis) was developed to produce a superior quality and purity. Palm oil, being a vegetable oils, is cholesterol-free. Having a naturally semi solid characteristic at room temperature with a specific origin melting point between 33ºC to 39ºC, it does not require hydrogenation for use as a food an ingredient. CPO is deep orange red in colour due to the high content of natural carotenes. Palm oil is rich source of carotenoids and vitamin E which confers natural stability against oxidative deterioration. Fractionation separates oil into liquid and solid fractions. Palm oil can be fractionated into liquid (olein) and solid (stearin) components. Palm oil has a balanced ratio of unsaturated and saturated fatty acids. It contains 40% oleic acid (monounsaturated fatty acid), 10% linoleic acid (polyunsaturated fatty acid ), 45% palmitic acid and 5% stearic acid (saturated fatty acid). This composition results in an edible oil that is suitable for use in a variety of food applications. Palm olein is the liquid fraction obtained by fractionation of palm oil after crystallization at controlled temperatures. The physical characteristics of palm olein differ from those of palm oil. It is fully liquid in warm climate and has a narrow range of glycerides. In addition to finding uses as in the case of palm oil, palm olein is widely used as a cooking oil. It also blends perfectly with other popular vegetable oils that are traditionally used in many parts of the world ; prompting a nickname ‘blending partner’ for palm olein. For example, in Japan, refined palm olein is blended with rice bran and in Malaysia, it is blended with groundnut oil. Like palm oil, palm olein is also widely used as a frying oil and much of its popularity is due to its good resistance to oxidation and formation of breakdown products at frying temperatures and longer shelf life of finished products. In fact, palm olein is considered as the gold standard in frying and is perhaps, on its own, the most widely used frying oil in the world! Palm stearin is the more solid fraction obtained by fractionation of palm oil after crystallization at controlled temperatures. It is thus a co product of palm olein. It is always traded at a discount to palm oil and palm olein; making it an cost effective ingredient in several applications. The physical characteristics of palm stearin differ significantly from those of palm oil and it is available in a wider range of melting points and iodine values.Palm stearin is a very useful source of fully natural hard fat component for products such as shortening and pastry and bakery margarines. In addition to palm olein and stearin, there are easily a dozen other fractions, obtained from palm oil including various grades of double fractionated palm olein (aka superolein) and palm mid fractions. Where pourability and clarity can be issues for palm olein, especially in temperate countries, superolein finds uses as frying oil and cooking oil, usually in blends with seed oils. Palm mid fraction is commonly used as a highly versatile natural ingredient in the manufacture of tub margarine and in CBE manufacture. Palm kernel oil is obtained from the kernel of the oil palm fruit. The oil composition is very different from that of the palm oil. Palm kernel sterain is the more solid fraction of palm kernel oil obtained from fractionation. Palm kernel oil, palm kernel olein and palm kernel stearin find uses in margarine, confectioneries, coffee whitener, filled milk, biscuit cream and coating fats; with little or no further processing. There is a growing trend to use palm kernel oil products as an ingredient in the production of non-hydrogenated trans fat free margarine. Palm kernel stearin is widely used to substitute for the more expensive cocoa butter in many of its traditional applications. In some instances, particularly when hydrogenated, palm kernel stearin exhibits performance superior to that of cocoa butter. Apart from their excellent melting properties, hydrogenated palm kernel oil products generally have good resistance to fat bloom and show good resistance to oxidative stress. Tocotrienols are members of the Vitamin E family comprising of Tocotrienols and Tocopherols. Tocotrienols differ from the Tocopherol’s in that they contain three double bonds in the side-shain (see molecular structure). Tocotrienols Isoprenoid side chain has three double bonds as compared to Tocopherol’s saturated side-chain. 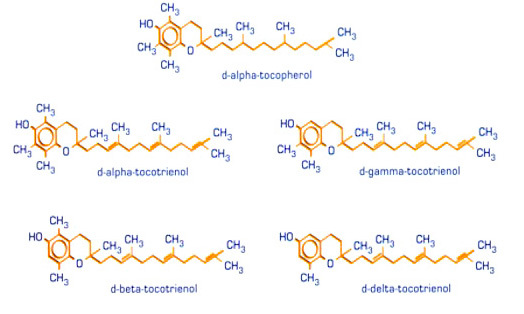 In total, there are four types Tocopherols namely alpha, beta, gamma and delta and four corresponding of Tocotrienols isomers. Alpha Tocotrienols is 40-60 times more potent than normal Tocopherols making it one of the most powerful lipid soluble anti oxidants available.